Like my Facebook page to get the updates!!! Welcome to Mentor for Bank Exams. Here I am sharing MCQ’s PDF of professional knowledge for IBPS SO Agricultural Officers. The PDF consist of 40 sets of MCQ’s with 15 questions each all-together 600+ questions. This will help you in the preparation of upcoming IBPS SO Agricultural Officer. Kindly make use of this!!! Download the IBPS SO Agricultural Officers Digest here. Welcome to Mentor for Bank Exams. Here I am sharing MCQ’s PDF of professional knowledge for IBPS SO IT Officers. The PDF consist of 24 sets of MCQ’s with 20 questions each all-together 480 questions. This will help you in the preparation of upcoming IBPS SO IT Officer. Kindly make use of this!!! Download the IBPS SO IT Officers Digest here. Welcome to Mentor for Bank Exams. Here I am sharing the most important topic General Awareness/Current Affairs, questions asked in various recent exams 2016 (SBI, IBPS RRB, IBPS PO, SBI- Associate PO). Welcome to Mentor for Bank Exams. Here I am presenting the November 3rd week Current Affairs Weekly PDF for the quick revision of all the important happenings of the week and this PDF will help you to revise news in exam time. Kindly make use of this!!! In this current affairs weekly PDF I have gathered all the important happenings of the week as one liners which will help you out in your revision time for the upcoming bank exams like IBPS PO, IBPS RRB, IBPS Clerk and other competitive exams. All the important National News, International News, Business News, Sports News, Science and Technology News, Banking News were covered in this PDF. Like My Facebook Page for updates of the blog. Welcome to Mentor for Bank Exams. As you all are aware of that IBPS has released the Admit cards for the recruitment of Clerks. Many of you may finish your preparation part and in the revision period. To boost your revision and pushing your confidence to the next level I am presenting the Mini Mock Tests for the upcoming IBPS Clerk Exams. The test consist of three subjects which are in mentioned in the preliminary exam pattern viz. English, Quantitative Aptitude and Reasoning each of 10 questions according to the latest pattern. Kindly make use of these!!! Directions (1 – 10): Read the following passage carefully and answer the questions given below it. Certain words/phrases in the passage are printed in bold to help you locate them while answering some of the questions. From assisting his father Dorjee Khandu in politics to working for social transformation, Pema Khandu has travelled a long way to sit in the coveted post of chief minister of Arunachal Pradesh. 37-year-old Pema, the youngest chief minister of the country, is all set to follow in footsteps of his father and former chief minister Dorjee Khandu, who died in a chopper crash in 2011 near Luguthang in Tawang district bordering China. Eldest son of the family, Pema, a graduate from Delhi's prestigious Hindu College had an early entry into governance after his father's demise. And in five years, he has emerged as the chief ministerial prospect after Supreme Court's intervention that changed the course of politics in the state with dissidents returning to Congress. Pema, who hails from Tawang, first entered the Arunachal Pradesh assembly in 2011 to fill the vacancy caused by his father's death. His election as MLA from Mukto (ST) constituency was uncontested and he was soon included in the state government as Cabinet Minister for Water Resource Development and Tourism in the Jarbom Gamlin ministry. He also became the cabinet minister for Rual Works Department (RWD) and Tourism since November 21, 2011 in Nabam Tuki government and thereafter served the state as cabinet minister for Tourism, Civil Aviation and Art & Culture. He was re-inducted as the Urban Development Minister on June 1 2014 in the Nabam Tuki government after the general election. He quit as minister in October last year and sided with dissident Kalikho Pul. Hailing from Gyangkhar village under Tawang district, Pema is the father of two sons and a daughter. He belongs to the Monpa tribe. Pema was re-elected unopposed from Mukto in the 2014 assembly elections. Soft spoken, globetrotter Pema, who travelled to Japan, Thailand, Macau, Sri Lanka, USA, Canada, South Africa and Bhutan, is associated with numerous socio-cultural organisations, including Bodhi Language & Literature Promotional Society as chairman. He also championed civil-Army relations, plantation drive in hilly Tawang district, organised periodical medical camps in various parts of the district. Besides promoting games and sports in the district, Pema also patronized talent search among local youth to preserve traditional songs by conducting talent show in Tawang and West Kameng districts. He is also fond of various sports including football, cricket, badminton and volleyball. He is keen on developing a peaceful and socio-economically vibrant state with cordial relations among various tribes of the state. 1. What changed the course of politics in the state? 2. As per the passage, Which of the following DOES NOT define Pema Khandu? 3. Which of the following statements is/are False? 4. Which of the following position (s) did Pema hold before being the CM? 5. How many family members of Pema are in politics.? Directions (6 – 8): Choose the word which is most SIMILAR in meaning to the word printed in bold as used in the passage. Directions (9 – 10): Select the word which is most OPPOSITE in meaning of the word printed in bold as used in the passage. Directions (1 – 5): Study the following pie-chart and answer the following questions. 1. The number of employees in section B is approximately what per cent of the total number of employees in section D and section E together? 2. If twenty five per cent of the employees in section C are females, what is the number of male employees in section C? 3. The difference between the total number of employees in section A, B and C together and the total number of employees in section D, E and F together is exactly equal to the number of employees of which section of the company? 4. 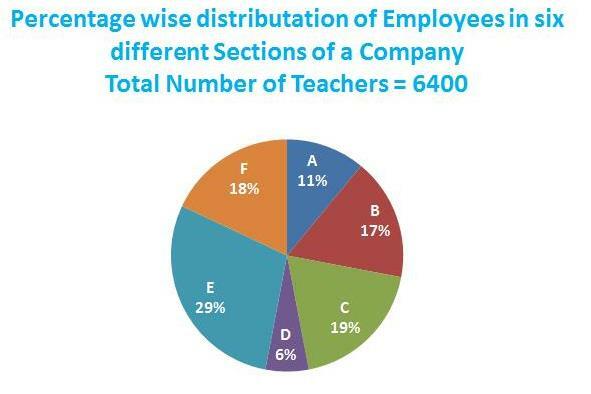 If one-thirty sixth of the employees from section F are professors and the salary of each employee is Rs 96000, what will be the total salary of all the employees together from section F? 5. What is the average number of employees in sections A, C, D and F together? Sai Ram has deposited an amount of Rs 7600 at the rate of 4% per annum for three years. After three years all the sum he received was again deposited at compound interest at same rate of interest for next two years. 6. Find the total amount that Ramdeep received at the end of five years. 7. 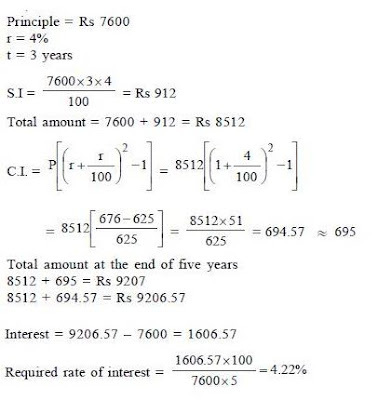 What is the difference between the amount Ramdeep received from simple interest and that from compound interest? 8. Find the overall percentage rate of interest on the whole transaction. 10. A, B and C start at the same time in the same direction to run around a circular stadium. A completes a round in 252 seconds, B in 308 seconds and c in 198 seconds, all starting at the same point. After what time will they again at the starting point? Required percentage = [17/35]*100 = approx. 49%. Number of male teachers = 75% of 1216 = [3/4]*1216 = 912. Difference = 6% = University D.
5. C) 11+19+6+18 = 54%. 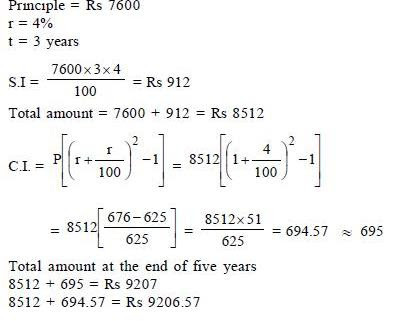 Average = 54/4 % = [54/400]*6400 = 54*16 = 864. 10. D) L.C.M. of 252, 308 and 198 = 2772. So, A, B and C will again meet at the starting point in 2772 sec. i.e., 46 min. 12 sec. Eight students studying in different standards 1st, 2nd, 3rd, 4th, 5th, 6th, 7th and 8th namely – A, B, C, D, E, F, G, and H are seated around a circular table facing the centre. C sits third to the rights of H. H studies in 8th. 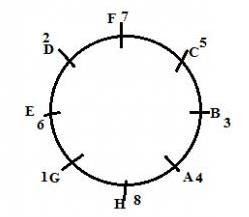 F sits second to the left of E. E is not an immediate neighbour of C or H. The one who studies in std. 1 is an immediate neighbour of E. Three people sit between H and the one studying in std. 7. H, C and also their immediate neighbours do not study in std. 2. Only one person sits between the student of std. 2 and G. Students of std. 3 and 4 are immediate neighbours of each other. C is neither in std. 4 nor in std. 3. Only one person sits between A and the student of std. 5. A does not study in std. 2 or 3. B does not study in std. 2. 1. Which of the following is true regarding F? b) D and G are immediate neighbours of F.
d) F sits second to right of A. 2. Who among the following studies in std. 3? 3. Who among the following represents immediate neighbours of G? a) One person sits between H and the student of std. 2.
b) Only one person is sitting between student of std. 4 and std. 6.
c) The one studying in std. 3 is an immediate neighbour of H.
d) D studies in std. 2. 5. How many persons sit between D and the student of std. 4, when counted from the left hand side of student of std. 4? 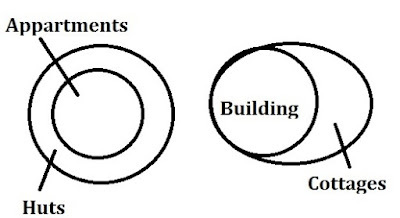 (8 – 10): Statements: All apartments are huts. No hut is a building. All buildings are cottages. 10. Conclusions: I. Some cottages being apartments is a possibility. II. No cottage is hut.